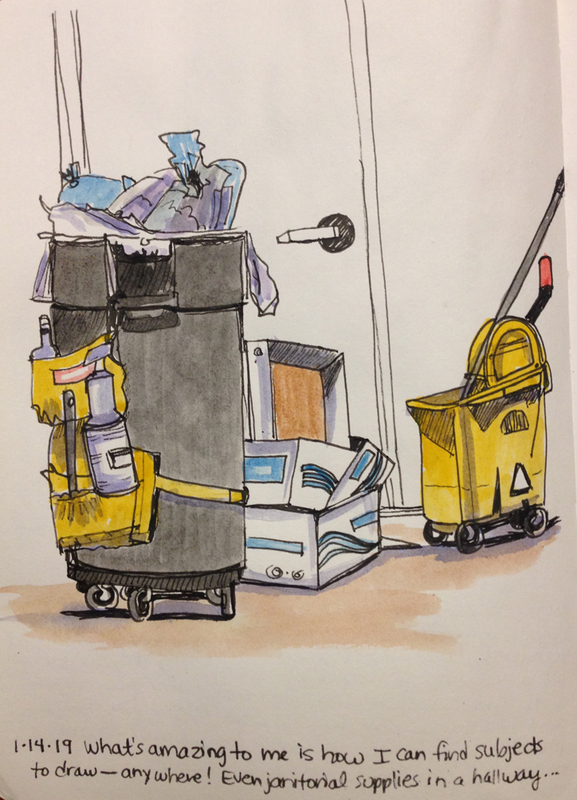 Last night I was out in a hallway of an office building and noticed an interesting still-life sitting right in front of me—a fully laden trash can on wheels, old boxes, and a janitor’s mop and bucket. I liked all the shapes, colors, and textures! I listened carefully for the elevator, knowing a woman would come eventually and clean the floor. It was obvious she was on another floor, so I sat down to sketch. I started with the can and worked my way down and to the right. I sketched in ink (Faber-Castell Pitt pens, watercolor was done later at home). It was fun to capture this tiny slice of life… about 20 minutes or so later, I heard the elevator whir, and knew someone was coming up. Sure enough, the janitor came out and began vacuuming the hallway where I was sitting on the floor. I went into the office where my daughter’s appointment was. About ten minutes later, we were ready to go. We went out into the hallway and all my still-life items were split up, in different places, trash in front of the elevator, boxes removed…. I told my daughter that I had captured something on paper that will never look the same, ever. Those items will never be posed in exactly the same spot, the same angle, or with the same items. I captured a moment in history! And I have a sketch to show for it. One of the joys of urban sketching—-capturing these slices of life that we will never see again!